"We turn to standard products and uniform platforms wherever it's possible," said Sven Lorenz, Porsche's manager of information systems. STUTTGART — Sports car maker Porsche AG is considered a paragon of manufacturing efficiency. 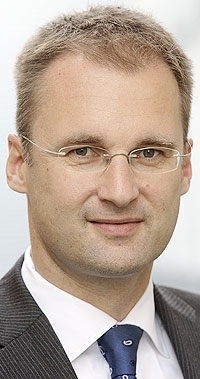 Sven Lorenz, Porsche's manager of information systems, spoke about his department's goals and the limits of standardization during an interview with Staff Reporter Matthias Krust of Automobilwoche, a German-language sister publication to Automotive News. What does your boss, Wendelin Wiedeking, expect from the people in charge of information technology? He expects the highest possible degree of efficiency, calculability and transparency. This relates to finances as well as security and the availability of IT. This is enormously important due to IT's high penetration within the processes of automobile manufacturing. In addition, we are supposed to make process improvements possible through innovations and enable the departments to constantly increase their contribution to value. What are Porsche's IT costs? We don't publicize specific figures from our budget. In general, IT costs in manufacturing are about 2 percent of revenues. But if you look at Porsche's strong growth in recent years and the clear performance increases that we have generated in connection with it, then you'll realize that IT operating expenses have only gone up negligibly in comparison. Porsche traditionally sets extremely high productivity goals for itself in manufacturing. Is that also true for IT? Of course. We've already achieved considerable productivity gains of roughly 10 percent annually. This can be reached with multifaceted measures, and we keep switching from one to another. That's because you naturally can't push the same buttons every year. Some examples include continuous improvements in procurement, partly with benchmark investigations beforehand, process improvement and license management. And, naturally, we keep achieving economies of scale, through the broader rollout of standard platforms such as SAP, for example. What is the relative importance of standardization? That is absolutely an issue for us. To achieve consolidation effects, we turn to standard products and uniform platforms wherever it's possible and wherever they make sense, whether it's on the level of infrastructure or application. Standardization also has its limits. Ultimately, we have strong process elements. This can't be a matter of standardizing the costs of business processes and the creation of value. Porsche has perhaps the lowest share of its own manufacturing within a value chain in the auto industry. Was this approach carried over to IT? Yes, even very directly. Internally, we actually have a very lean IT organization with relatively low vertical integration. Basically, we concentrate on the architecture and management skills. On the other hand, we outsource flexibly to a great extent to our partners on project, product and service management as well as strategic planning, system development and operating activities. We have two important partners inside our own company. On one side, there is our wholly owned subsidiary, the Porsche Information Communication Services. It operates the computing centers and data networks for Porsche AG. On the other side, there is MHP, Mieschke, Hofmann and Partners, an IT and process consulting firm, which supports us with application development and operations, almost as an extended workbench. How many people are employed within Porsche IT? About 180 employees work in the IT area at Porsche AG. That puts us in a very lean and flexible position. And we should stay that way.